….but travel in Southeast Asia can sometimes mean relinquishing some of that freedom and being a slave to train times, bus routes and tuk-tuk drivers. We decided to bust out of the shackles and hire a car to see the more hard-to-reach parts of Northern Thailand. And we did it at our speed, away from the crowds and stopped whenever we wanted! Our plan was loosely based on getting to Phu Chi Fa, the Golden Triangle, the Myanmar Border and then popping in to some of the temples that are away from the town centre as we got back to Chiang Rai. It was. Some of the most relaxing and off the beaten track moments we had in Thailand. Well everything you need is below! Do I Need a Sat Nav? Here are the five main reasons we hired a car. We felt it was a better option than trying to organise a tour as it gave us so much more freedom. The great news is that we discovered alot more than this. The drive will captivate you every step of the way, with the landscape changing from plains, to mountains, rice fields and rivers. There are some specific points of interest along the way, but alot of the time you’ll be pulling over to the side of the road just to take in the scenery. Even without the highlights below it was an incredible trip! Phu Chi Fa – the most beautiful place in Thailand you’ve never heard of! A mountain top viewpoint over Laos, famous for its sunrise above the clouds (if you click the link I have written a longer piece about it). The Golden Triangle – where Thailand, Laos and Myanmar meet, and (normally illegal) traders would quickly get their goods from one country to another, trading in gold to avoid local currencies. The main product sold here for many years was opium, with local hill-tribes growing vast quantities to support their income. Mae Fa Luang Garden – a perfectly landscaped botanical garden with treetop walks. 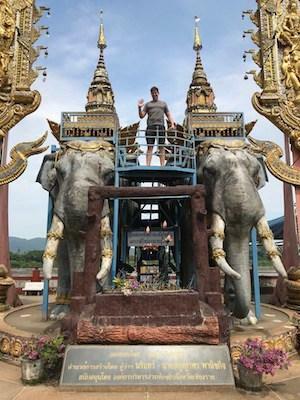 The Black House and Blue Temple – both of these places are just outside Chiang Rai, but we decided to incorporate them into the road trip because it was easier than hiring a tuk-tuk or taxi to get us out to them. We hired our car from Chiang Rai airport as this seemed to have the best selection at reasonable rates. Most of the places in Chiang Rai itself don’t seem to have websites so it made it hard to work out their prices. We booked with Hertz, and just got a taxi from Central Chiang Rai to go and pick it up. Total cost was £68.31 for a three day hire. Taxi to the airport was only 150 Baht. It is a legal requirement to have an international driver’s permit when driving in Thailand (see the RAC list here). I however, didn’t realise this until AFTER we had taken the trip. At the booking desk I showed them my UK driving license, and they let me take the car! There is alot of discussion about the subject on this forum and it seems the conclusion is that the police don’t seem to care too much HOWEVER, if you are in an accident then your insurance would be void. I would not take the risk again. It only costs £8 for a year, and is easy to apply for by filling in this form. I would suggest downloading the fantastic app Maps.Me before you leave. This allows you to have offline maps that will allow you to navigate, without having to use any international roaming or data fees. You can just choose your location (use the map below for where we drove to) before you leave and it will direct you. There are alot of warnings about driving in Thailand and the risks associated with it, but we had no problems whatsoever. It is particularly easy to adapt to if you’re British as they drive on the left hand side. The roads were good, and this being quite a quiet part of Thailand there was very little traffic at all. The main hazards were moped drivers appearing from side streets and the windy mountain roads. The roads near the border in the north were particularly good as there has been alot of foreign investment. Many being double lane roads, with barely any cars other than us! The only difficult towns for driving were Chiang Khong where they get quite narrow and congested, and the big and busy highway heading away from the border at Mae Sai. Neither of them were anywhere near as bad as roads in places such as Bangkok or Chiang Rai, these just needed a bit of extra concentration. The rural roads near Doi Pha Tang viewpoint in the east became dirt roads for a while, with a couple of them having gouges down the middle due to the rain. The roads over Doitung mountain and through the national park in the west were very windy, with multiple switchbacks. Neither were particularly dangerous for a competent driver, just take them slow and beep to let oncoming traffic know you’re there. It’s worth noting that on Thai automatic gearboxes there are three settings, D for standard drive, S for sport (haha, not in our little car!) and B which is used to engage the clutch on steep downhill sections. I had not seen these settings before, so am not sure if this is universal in Thailand, or just the brand of car we hired. After you’ve picked up the car from the airport, it’s time to head out through the mountains to Phu Chi Fa. The drive is around 110km, which includes driving to Phu Chi Fa and making your way over to the accommodation for the evening. This was the first of many unexpected finds on our road trip. There are an almost unquantifiable number of temples on the route, and if you were to stop at every one you would be travelling for months! However when we saw this we had to pull over. 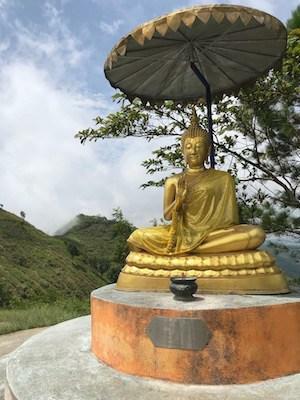 Visible from the road was a huge golden Buddha overlooking a lake. It seemed completely out-of-place at the edge of a fairly small village. It is located just after the road turned left onto route 1174. 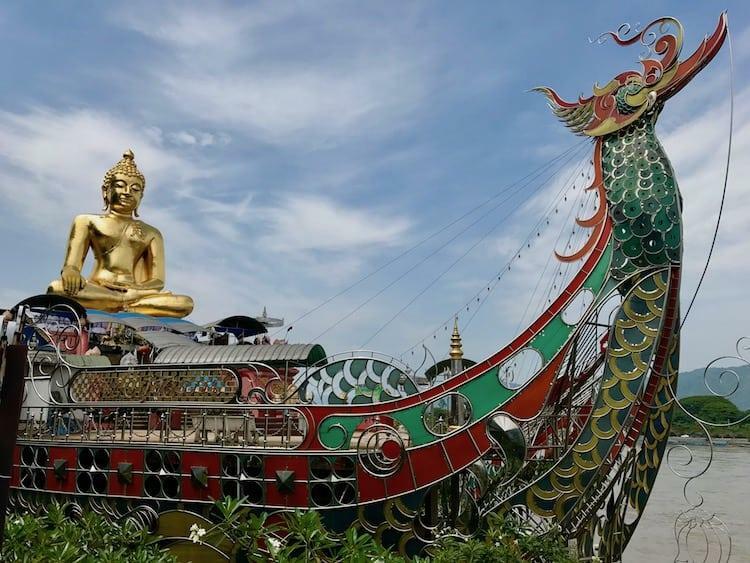 If you pull off the highway, down a small dirt road, you will drive past the main Wat where you can park up by the lake and get some photos of this giant statue. It’s an incredible sight, especially given its location, in what feels like the middle of no-where. The journey over the flatter countryside had been fantastic, but about 70km outside Chiang Rai the scenery changed quickly, as we headed steeply up into a ridge of mountains that stretch right up to the Laos border. There is only one road through the middle, which sharply took us up around 750m in less than 5km. This is a road that wouldn’t be out of place in a cycling grand tour, it would be the perfect battleground for the climbers! At the top we saw signs for a viewpoint, so headed a few hundred metres off of the main road. From Ban Phaya Phipak we could see right the way down the side of the mountain range, and back down onto the flatter plains we had just spent the last hour or so driving across. A stunning view, and one we had completely to ourselves! If you want more details about Phu Chi Fa, I would suggest reading my article Phu Chi Fa | A Road Trip to Find the Ultimate Sunrise as it will give you much more information than I have space for on this post. In short is in a stunning viewpoint, that straddles the Thailand/Laos border and gives unforgettable views across Laos and down to the Mekong. It was one of the main reasons we had decided to hire a car in the first place. Whilst we wanted to get there for the sunrise views, we decided it was a good idea to head up in the daylight, so we were fully prepared for the drive and climb that awaited us in the morning. Holding hands across whilst in two different countries! It is easy to miss the turning off the 4029 road that takes you up to Phu Chi Fa, so be careful. It looks more like a private road that it does a turning up to a major viewpoint. This couple of kilometres up to the viewpoint car-park is really hard going, with the road getting up to some extreme gradients in places. There were points were I had my foot all the way down and the car was barely moving! Once you get to the car-park there is then a relatively tough 20 minute or so hike to get to the top. Take it slow, and make sure you pack bug spray! Full details are in the article above. The view makes it more than worth it though, and really made us excited for the sunrise in the morning. You also get to tick another country off the list, as you will technically cross over into Laos at the top! Sometimes when travelling you just get lucky, and this was one of those occasions. We had booked in at a guesthouse in Phu Tawan village via Booking.com, but unfortunately there had been a problem. The guesthouse was actually closed as it was not peak season, but it had not been removed from the website. We wandered across the road to a place called PhufhaSawan Resort, and asked if they had any rooms. The lady offered us a wooden cabin with a fan and a shower for 1000฿. We could not have been more lucky. We had the entire resort to ourselves, and the views were unbelievable. At the end of our cabin was a lush green valley, stretching out for miles. They had a seating and deck area outside a cafe (which was closed at this time of year) so we just sat out and watched the sun disappear behind the mountains. We had managed to pick up some noodles and drinks from a local shop in the next village, so we had enough to survive the evening. It was one of those nights that we won’t forget in a hurry. These are the kind of views that you would pay hundreds of dollars a night for in some parts of the world, but tonight we had it all to ourselves. At midnight we were woken up to the most barbaric lightening storm we’d ever witnessed. The room felt like it was continuously lit up as the strikes peppered the valley in front of us. PhufhaSawan Resort does not seem to be available on any major websites, and they did not speak any English, however they have a website with an email address that you might be able to use if you want to try to secure a room www.phufhasawan.net. Today’s drive is around 160km. 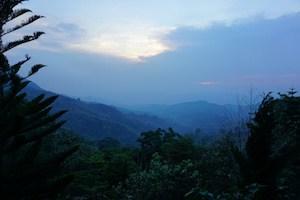 After an early start to see the sunrise at Phu Chi Fa, the route heads along the Mekong river beside the Laos border. You will finally reach the Golden Triangle, before back-tracking 5km or so to stay in Chiang Saen for the night. Without labouring the point too much, check out my article Phu Chi Fa | A Road Trip to Find the Ultimate Sunrise to get full details on Phu Chi Fa. 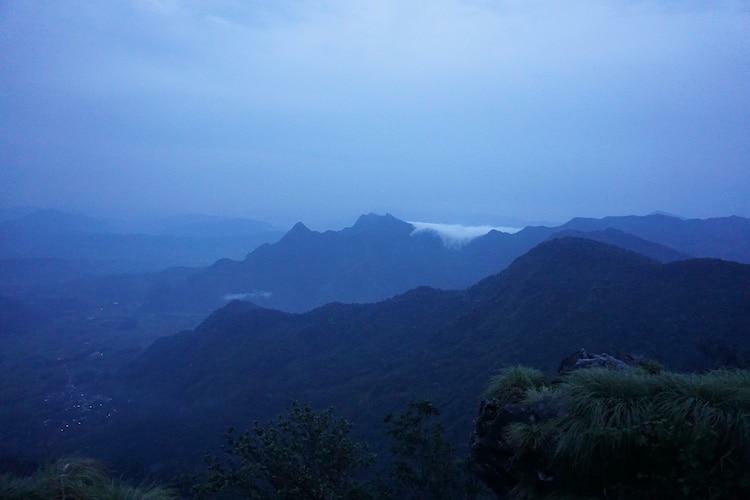 We got up and left around 0445 to get to Phu Chi Fa for sunrise, which at this time of the year is around 0550. It is about a twenty-minute drive from the accommodation. It is well worth the early alarm call. We weren’t treated to the classic ‘cloud filled valley’ version of Phu Chi Fa, but watching the sky change from black, through dark blues, purples, and then turn into a fiery red was one of those travel experiences that should go right on top of your Thailand to-do list. After spending an hour or so here, we heading back to the resort to have a shower and a catch-up nap, before being treated to an amazing egg sandwich and an apple salad made by the owners who clearly felt guilty they couldn’t provide dinner for us the night before. It was an unexpected and wonderful gesture, and with full stomachs we hit the road again. Another unscheduled viewpoint that we saw on our Maps.Me app. 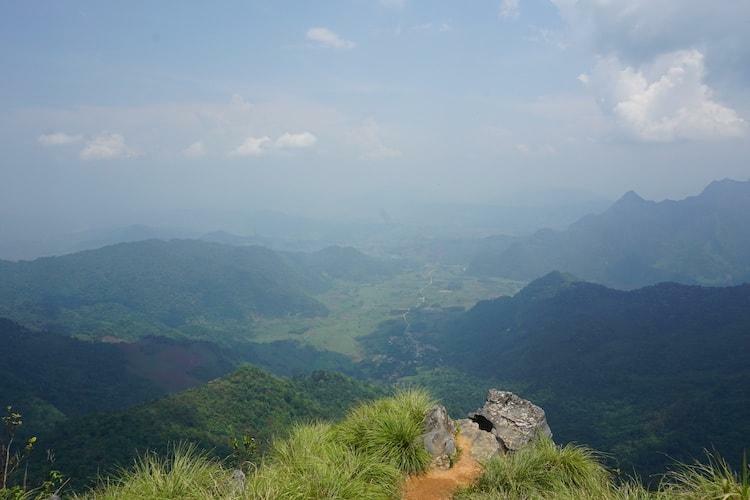 Doi Pho Tang is another spectacular viewpoint that gives panoramic views across Thailand and Laos. 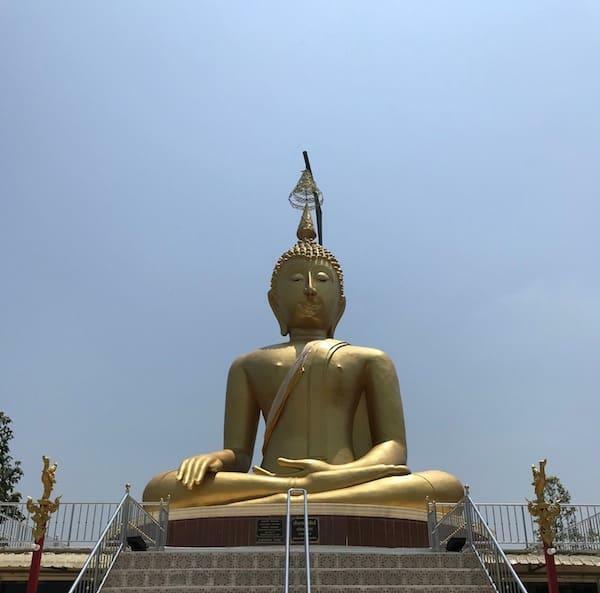 There is also a small temple here, with another golden Buddha statue perched by the hilltop. We decided not to hike right the way up to the viewpoint, as the clouds were rolling in fast and we were right in the heat of the day. Looking at the photos on this website though, I kind of regret not making the extra effort. I didn’t realise quite how spectacular it was at the top. Before you head off, top up your supplies at one of the little stalls by the car-park. If you can find her, there was a lady selling tasty dried fruits and sugared almonds that were a perfect snack. She had little tasters of each available so you can choose your favourite! On the drive down from Doi Pha Tang towards the Mekong, take extra care. Some of roads turn to dirt without any real warning, and after the rains they can have big gouges cut into them. Our little car was more than up to the challenge, but I would be especially wary of you’re doing this trip in rainy season. Really? You’re recommending a coffee shop on a road trip? Don’t knock it until you try it! 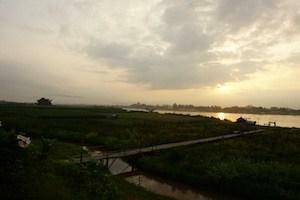 As the 1155 turns north-west you will get your first glimpse of the mighty Mekong river. Make sure you keep both hands on the wheel, as it’s hard to take your eyes off of! I’d never seen a river quite so wide, and it was much busier than the roads, with all manner of boats going about their business. Thankfully you don’t have to wait long for the perfect stop off. 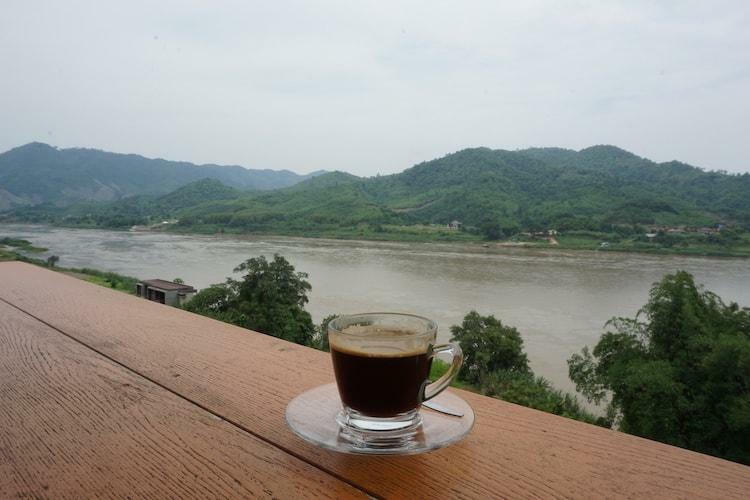 Panorama Coffee sits right beside the river, with a deck area that gives you the perfect spot to watch daily life unfold on the Mekong. And watch it unfold we did! With coffee, Coca-Cola and some homemade cakes, we sat back and watched the world go why with a monk and his driver. After a long drive up the Mekong and through both Chiang Khong and Chiang Saen (where we’ll head back to for the night) we arrived at the Golden Triangle. Be careful on the drive through Chiang Khong as the roads narrow and fill with tuk-tuks and mopeds. It feels like a far-flung suburb of Bangkok! After Chiang Khong the road has clearly been heavily invested in. Despite it being a steep road that cuts through the mountains, the highway is mostly dual -aned, immaculately surfaced and doesn’t look more than a couple of years old. The only kind of elephant riding you’ll ever find me doing! The Golden Triangle is somewhere we wanted to visit, but weren’t necessarily looking forward to. Unlike the rest of this road-trip it is a major tourist hub, with Chinese tourists especially flooding here after trips down the Mekong. This place has a notorious history. It has long-been a hub of illegal trade and smuggling, which centred for a many years around opium and narcotics. With three countries meeting, it was illegal to move goods quickly out of the jurisdiction of one police force to another. This might seem like something long in the past, but the United States as recently as January 2018, put sanctions on the ‘Special Economic Zone’, a casino area hacked out of the Laotian jungle that has said to be openly trading rhino horn, bears, tigers and narcotics. This, as is so often the case, has been linked back to China and their use of traditional medicine, a story you hear often across Southeast Asia where illegal trade in endangered wildlife has nearly wiped out a species. You can see the casinos that China has funded over the river in Laos on the drive from Chiang Saen to the Golden Triangle. They look completely out-of-place sticking out of the dark green trees that are now fighting for space. The Golden Triangle itself was actually was not as bad as we’d expected. It was busy, and a little soulless and run-down, but it was definitely worth a visit for half an hour or so. Not a glowing indictment I know, but if you’re in this part of the country it’s something you’ve got to do! 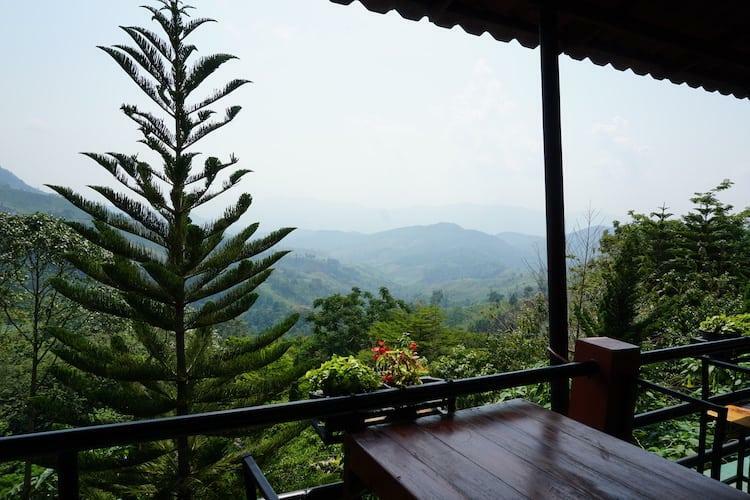 Gin’s Maekhong View was a spot of luxury for us on our road-trip. Sitting right on the banks of the Mekong, with its own bamboo walkway to the shoreline, it was the perfect place to sit back and enjoy this great river, and even had a swimming pool to cool down in. We were lucky enough to get a room with windows facing out towards the shore, and were treated to another remarkable sun-rise. I don’t think I’ve ever watched the sun come up two days on the trot! If you walk south down the road from the guesthouse you’ll come to some Thai restaurants that serve huge portions, and have decking that also looks out over the river. Whilst it was luxurious, it wasn’t actually that expensive at only 820฿ which is about £18. 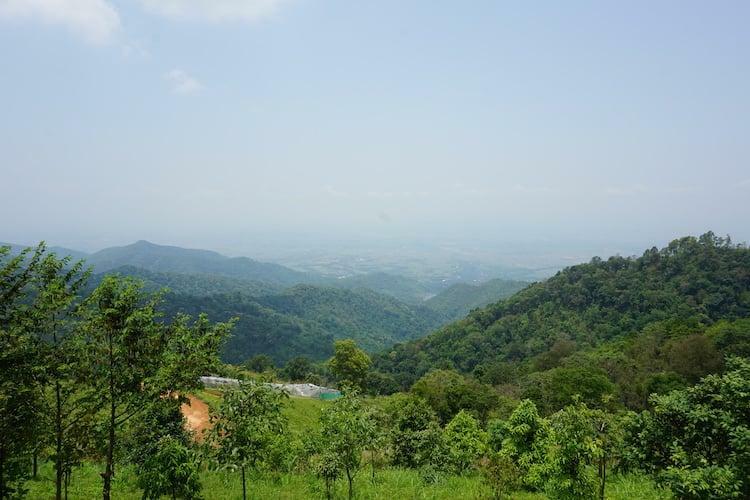 Day 3 is just over 160km, and will take you back to Chiang Rai via the border town of Mae Sai, Mae Fa Luang Botanical Gardens, and some more mountain driving. 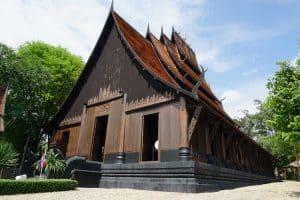 We also visited the Black House and Blue temple on the outskirts of Chiang Rai, but feel free to skip these out if you have plans to visit them on another day. After a drive of an hour or so, past the Golden Triangle and through Mae Sai (we couldn’t see any reason to stop here) we turned off the main north/south highway Route 1 (which heads all the way to Bangkok if you’re feeling up for it!). The road headed through a small village and then up some steep but well maintained roads up the side of Doitung. Occasionally we saw a break in the trees which afforded some hazy but far-reaching views over the valley below, of the kind that we’d been blessed with right the way through this road-trip. At the top is Mae Fa Luang, a Swiss style chalet built by the King’s Mother, and her flower garden just across the road. We decided not to visit the house, but bought tickets to the gardens for 80฿ each. 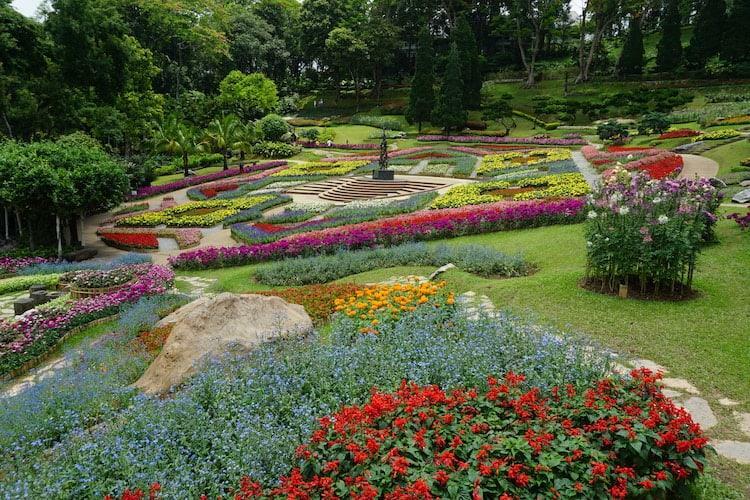 The gardens are beautiful, and apparently the best in the whole of Thailand. The range of flowers here is huge, and the way they have been landscaped into the mountainside is a photographer’s dream! 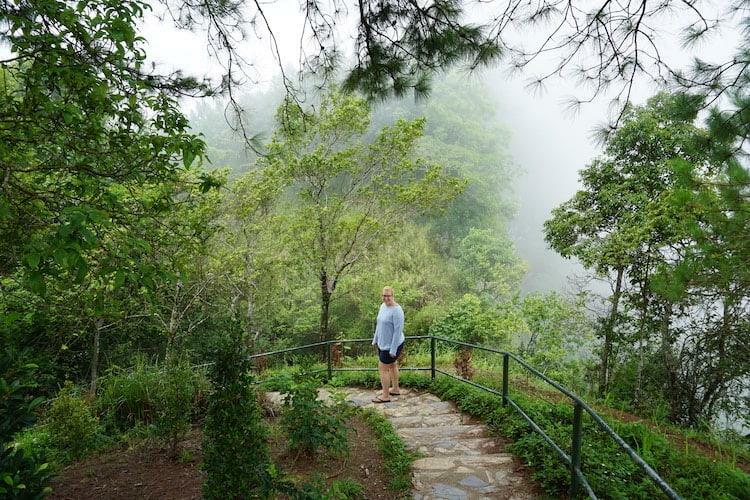 Our main reason for coming here though was to do the tree-top walk, a 300m long walkway that gets as high as 30m above the ground. For a person who does not get on well with heights I was apprehensive, however you are attached the entire way, moving your rope along a metal wire as you head through the canopy. The bridges move around a bit, and the second to last one was very high, but at no point did I have any genuine fear for my safety, just the odd butterfly in the stomach which makes things fun! 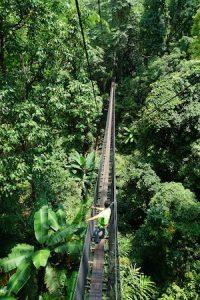 The treetop walk is an additional 150฿ per person, but well worth it. You can find more information here. After Mae Fa Luang Gardens, we decided to take the long way through the mountains to get to our next destination. If you are in a hurry you can easily cut this out and head back to route 1. We drove through some fairly dicey roads, that spent alot of their time as single-track, and had hundreds of switchbacks to deal with the gradient. It was a memorable part of the trip, the first time we’d felt almost alone in Thailand. The only people we saw were in the multiple hill-tribe villages we drove through, and the men with large guns at a check-point who stopped us (we’re still not sure if they were soldiers or poachers, but they were friendly enough and let us go by!). Whilst there is nothing specific to see at this point on the road trip, if you have time then do it. You will see authentic hill-tribes, not the shows put on for tourists near the big towns, and experience truly rural landscape unlike anywhere else in Thailand. There are also leopards and elephant wild in this area, but I imagine they are much further off, away from the villages and roads. 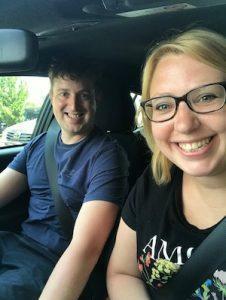 We had also planned to go to a tea plantation just after we left the national park area, however by this time a huge storm had come in, and there was no way we were leaving the car! I have left it on the map if you want to check it out, and you can find more information here if you are interested. 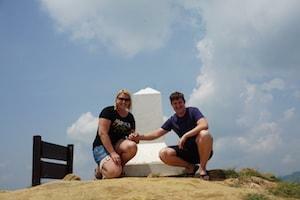 We were doing well for time so decided to stop into the Baandam Museum or Black House as we got close to Chiang Rai. This would save us paying for a tuk-tuk trip out here later in the week. We took a very small dirt road that juts off the highway and that felt completely wrong! There was no way one of the biggest attractions near Chiang Rai could be down roads like this? Wrong! We found it after a couple of u-turns, amid a mass of tour buses, that to this day I have no idea how they navigated the tight bends. 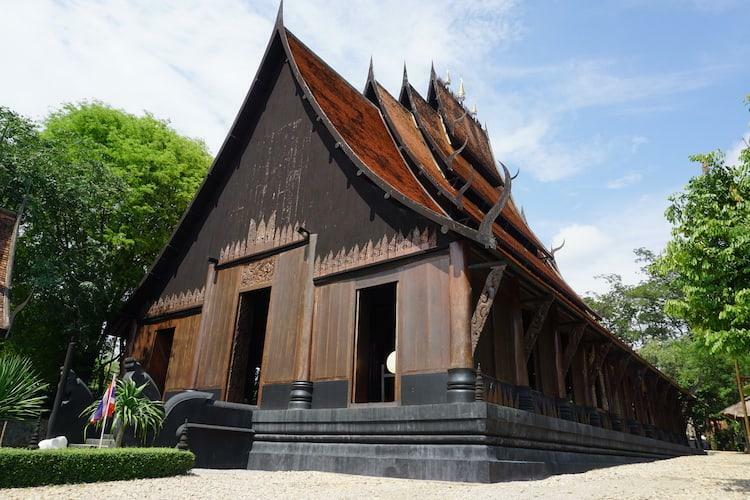 The Black House is the lifetime’s work of Thai artist Thawan Duchanee. Whilst he was Buddhist, this is not a religious site. It has been said to be a ‘commentary on the human condition’. Whatever it is I found it bewildering. This is a collection of buildings, all made of dark teak wood, spread out across a plot of land. And it’s dark on more than one level. 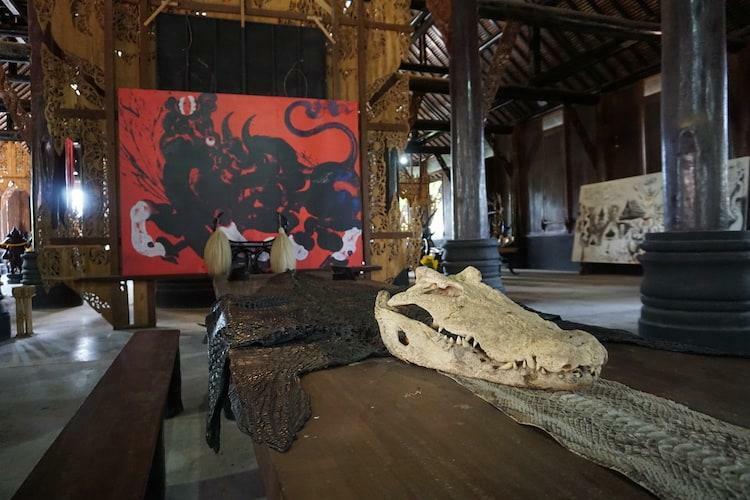 Every building contained something odd – animal bones, crocodile skins, antlers, horns, shark jaws. And amongst them was ornately carved furnitures, from long feasting tables to tiny wooden creatures. There were bathrooms, bedrooms, and living rooms – like a deconstructed house, put through a ‘make this really weird’ filter, and spread liberally across some grassland. Don’t get me wrong it was spectacular. The size of the main building was awe-inspiring, the detail in the sculptures intricate, the vision and unique creativity on show unlike anything I’ve seen. But it is really hard to figure out. Maybe it’s best not to and just accept it at face value. Talking value, the entrance fee was 80฿ per person. Pay your money and let your jaw drop, and your mind tie itself in knots. 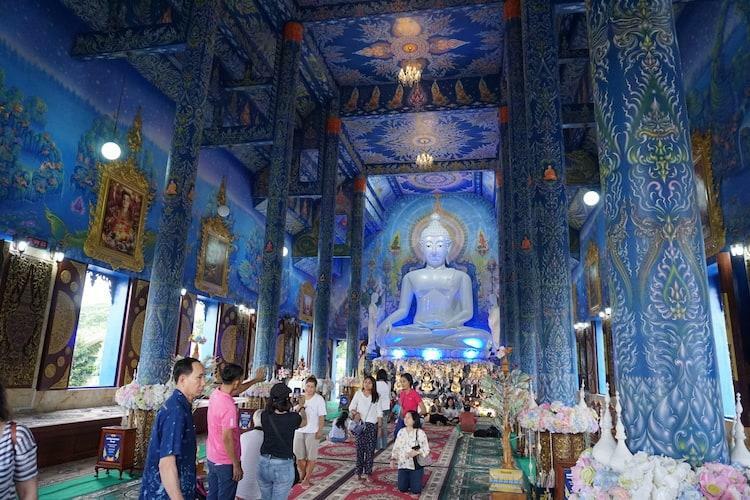 For our final stop off before heading back into Chiang Rai we dropped into the Blue Temple. 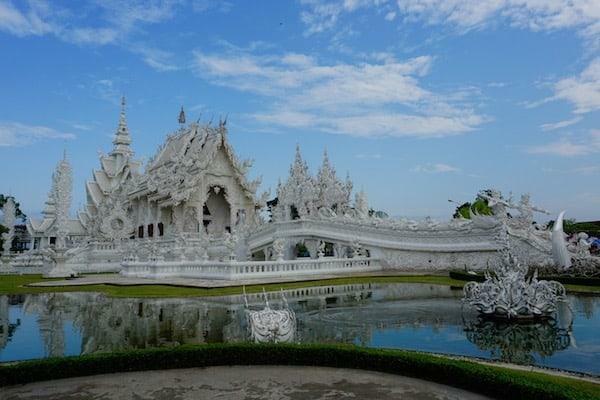 Temples in Thailand are astonishing. They are everywhere, so it’s easy to take them for granted after a while, but some really do stand out. 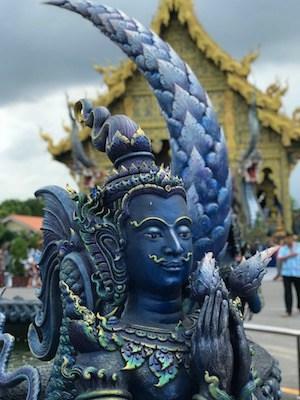 Colour themes seem to be a way to be distinct, with the White Temple in Chiang Rai, the Silver Temple in Chiang Mai and now the Blue Temple here. This one has only been finished since 1996, though there was a ruin of an older temple here that had been abandoned around 100 years before. The temple’s proper name is Wat Kong Suea Ten which translates as ‘House of the Dancing Tiger’. Like alot of Asia, there used to be wild tigers in this area which would apparently ‘dance’ over the local Mae Kok river. Unfortunately there are only two wild populations in the whole of Thailand now, so you’d be pretty unlucky to be set upon by one here. Despite being a fairly new temple, it’s popular, and we’d manage to time our trip as a bus load of tourists arrived, so we had a quick look around before heading off. There is no charge to enter the Blue Temple. 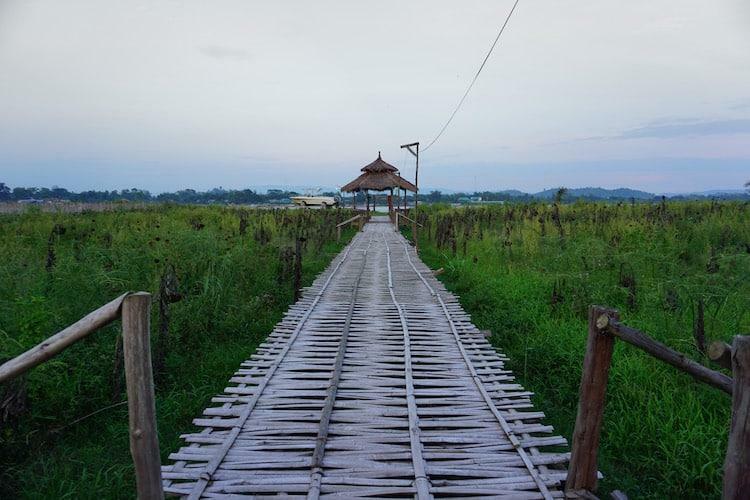 I hope you’ve enjoyed this article, and it’s inspired you to consider a road-trip out into Chiang Rai Province. Of all the things we did in Thailand, it ranked up there right at the top. There is nothing that quite compares with having the freedom to go where you like, stop when you want and move at your own speed. 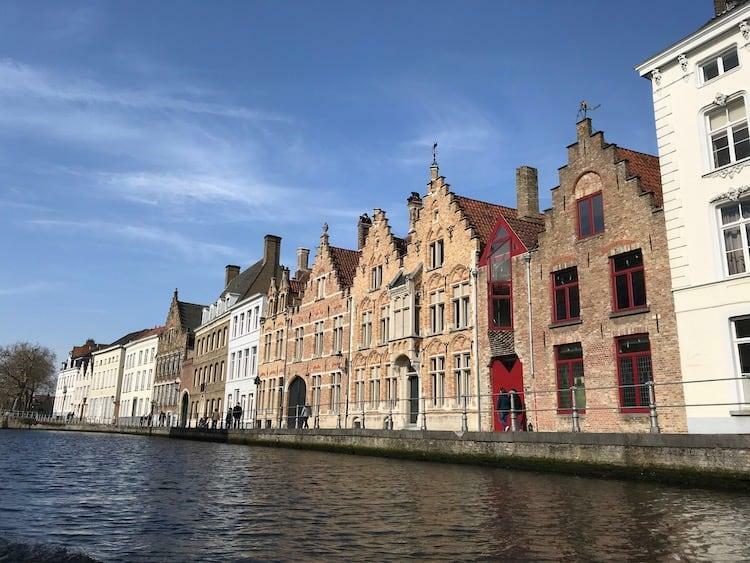 If you’re considering this trip and would like some advice, I’d be more than happy to help, so drop me a note on Ben@TheSabbaticalGuide.com. Also, if you’re looking for a recommended kit list for your road trip, check out this post. 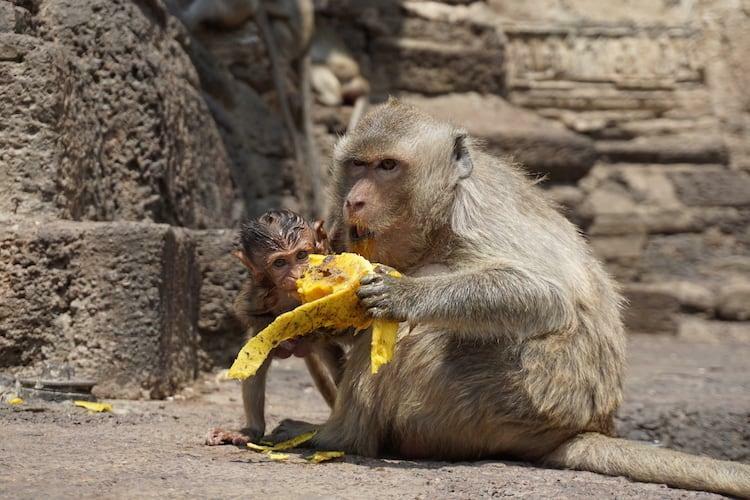 Previous Post Lopburi Monkey Temple, Thailand | Hail to Your New Simian Kings!